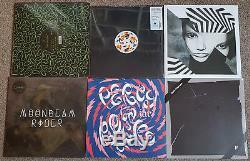 Lot Of 36 House, Abstract, Downtempo, Leftfield, Experimental, Hip Hop, Soul etc Boxset/LPs/12"s/7"s/CD. Simbiosi Elements 3 x 12 Boxset (Experimental, Techno, Industrial, Noise) 2015 Ninja Tune This Is New & Unplayed But NOT Sealed! Offshore -- s/t LP Marbled Blue Vinyl w/ Booklet & D/L (Downtempo, Experimental, Post Rock, Broken Beat, Leftfield) 2015 Big dada This Is New & Unplayed But NOT Sealed! Rustie -- Green Language LP With Download (Electro) 2015 Warp WARPLP253. The Invisible Patience LP With Download (Downtempo) 2016 Ninja Tune. DJ Spinna -- Heavy Beats Vol 1 DBL LP (Hip Hop) 1999 Rawkus. Larry Gus -- I Need New Eyes LP On Red Vinyl (Indie/Experimental, Electronic/Psychedelic/Indie Pop) 2015 DFA. Mark Pritchard Lock Off 12 EP (Ragga HipHop, IDM, Grime) 2013 Warp Records. Percy La Rock Ep 12 (Hip Hop) Rwina Records 2014 This Is New & Unplayed But NOT Sealed! Slugabed Moonbeam Rider EP 12 (Dubstep) Ninja Tune 2011. Dolor Misteria 12 EP 2013 (Hip Hop, IDM, Instrumental, Experimental, Dubstep) Technicolor. Sarathy Korwar Day To Day Remixes 12 (Deep House) 2016 Ninja Tune/Steve Reid Foundation. Mr Scruff Feat Denis Jones - Render Me (Remixes) 12 (House, Downtempo) 2014 Ninja Tune. Rodamaal, Manoo And François A Fortune Ep 12 (House) 2013 Buzzin Fly This Is New & Unplayed But NOT Sealed! Nathan Fake Degreelessness 12 (Techno, House) 2016 Ninja Tune. Kindness WDYL Who Do You Love? 12 (House, Disco) 2015 Female Energy This Is New & Unplayed But NOT Sealed! Old Apparatus Harem EP 12 (Abstract, Ambient, Downtempo, Drone, Experimental) Sullen one 2012 This Is New & Unplayed But NOT Sealed! 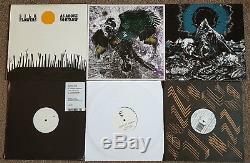 Old Apparatus Alfur EP 12 (Abstract, Experimental, Dub) Sullen one 2012 This Is New & Unplayed But NOT Sealed! Silk Flowers As Above So Below 12 EP (Electronic & Rock - Experimental, Goth Rock, Leftfield, Lo-Fi) Captured Tracks 2009 This Is New & Unplayed But NOT Sealed! Letherette -- Featurette 12 (House, Downtempo, Instrumental) 2012 Ninja Tune. The Invisible Generational 12 EP WHITE Coloured Vinyl (Leftfield, Alternative Rock, Deep House) 2012 Ninja Tune. Common -- Testify 12 (Hip Hop) 2005 Geffen. Akrobatik -- Internet MC's 12 (Hip Hop) 2000 Rawkus. The Sound Of The Murray -- The Sound Of The Murray 12 (Progressive House, Breaks) 2004 Bugged Out This Is New & Unplayed But NOT Sealed! Discordinated -- Electric Boy 12 (Electro, Synth Pop, Disco) 2003 Seeker This Is New & Unplayed But NOT Sealed! Fat Phaze -- Mateo 12 (House) 2003 Missdemeanours This Is New & Unplayed But NOT Sealed! One-Two -- My Baby Don't Care 12 (Garage Rock, Electro) 2006 Uppercuts This Is New & Unplayed But NOT Sealed! 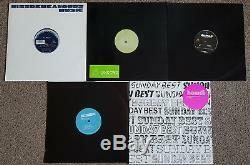 Howdi -- The Number One Song In Heaven 12 (Synth Pop) 2005 Sunday Best This Is New & Unplayed But NOT Sealed! Perel -- Charles Manson 12 (Deep House, House) 2016 Do Not Sleep This Is New & Unplayed But NOT Sealed! Deadmau -- Ghosts N Stuff 12 (Progressive House, Electro House, Minimal) 2008 Mau5strap This Is New & Unplayed But NOT Sealed! Dark Angel Music With A Message 7 (Dancehall/Dub) 2016 This Is New & Unplayed But NOT Sealed! Young Don't Give It Up / I Love My Girl 7 (Soul) 2014 Reel People Music This Is New & Unplayed But NOT Sealed! Chris Turner / Joonie Liquid Love / Far Away 7 WHITE Vinyl (Soul) 2014 Reel People Music This Is New & Unplayed But NOT Sealed! West Nkosi Nabashokobezi / Stars Twelve Mabone / John Tate 7 (Afrobeat, African) 2015 African Music Corporation This Is New & Unplayed But NOT Sealed! Ramrock Allstars Featuring D'Oxman Pon Mike Return Of The Gentleman Rudeboy 7 (Roots Reggae, Ska) 2014 Ramrock This Is New & Unplayed But NOT Sealed! DJ Food -- The Search Engine CD + Bonus 7 Flexidisc & 48 Page Book (Abstract, Downtempo, Hip Hop, Breakbeat, Broken Beat) 2012 Ninja Tune. 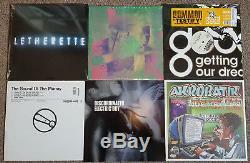 Bargain Lot Of Mixed House, Abstract, Downtempo, Leftfield, Experimental, Hip Hop, Soul etc Boxset/LPs/12"s/7"s/CD. (Label & Genre Is Listed At End Of Each Title Above). These Are All From A Warehouse Find And Are Unplayed, Just Been In Storage, Mostly Dating From Around 2011 Right Up To 2018! You Won't Be Disappointed In This Lot! This Is Perfect For Someone Just Starting To Collect As You Get A Bunch Of Top Tracks In One Lot Without Having To Pay Individual Prices. Also Perfect For Dealers Wanting Good Shop Stock Or For Presents For Budding DJs! BARGAIN Price To Clear Overstocks! All Records Are From A Warehouse Find And Are Sealed And New Unless Stated! For The Open Ones I Will Say They Are'Excellent' Or Better To Be On The Safe Side But Should All Be NM In Reality! The Sleeves May Have A Little Storage Wear But Nothing Major. If You Don't Know What These Gradings Mean Then Please See Below, Where It Says "Gradings Explained". All records get a visual grading, if I think there may be a problem, I will listen to it. I grade all my items Conservatively according to The Rare Record Collector Guide (Goldmine Equivalent In US) I only grade items as Mint if they are sealed. If you have any questions about our items or anything else feel free to message us. We're happy to help no matter what it is! 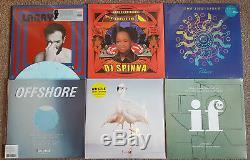 The item "HOUSE, EXPERIMENTAL, LEFTFIELD etc LP/12 VINYL RECORD COLLECTION JOB LOT DJ NEW" is in sale since Wednesday, January 30, 2019. This item is in the category "Music\Records". 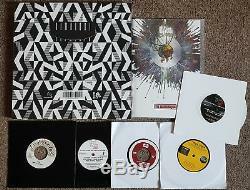 The seller is "nocomplyrecords" and is located in Lincolnshire Coast. This item can be shipped worldwide.